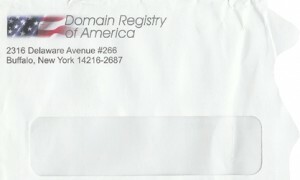 If you own a domain name, there is a good chance you have received a notice in the mail from Domain Registry of America, Domain USA, Domain Solutions Central or some other domain name service. Complaints have been filed and actions taken toward these companies as SCAMs. Their notices are deceiving. The FTC has levied injunctions against these companies and issued a consumer alert for domain name registration scams. Wikipedia has a section under Domain Name Registrar called Transfer Scams where these practices are labeled as “domain slamming” (similar to phone slamming). PC Magazine posted an article on these domain name scams in late 2007. It is extremely important that you do not purchase a domain-name or pay any money to these companies. You will not get any support, backup or after-sales service. You may also find it impossible to “do” anything with the domain-name (such as transfer the domain elsewhere) after purchase, without additional costs being levied. These companies are constantly changing their names and operations, so be aware of any cold-callers – see an examples of tactics that are used on our menu on your left. How do you verify these? If you receive a piece of mail (or email) regarding your domain name or search engine submission, a quick search usually answers your question on validity. Share your experience with these companies. What did you do to remedy the situation? What do you recommend for others? One Comment on Watch out for Domain Registry Transfer SCAMs! Funny, I received one of those in the mail earlier this week and was going to write a blog post about this very topic myself. I think it is ridiculous how they look like Invoices. They are definitely deceptive and scammy in appearance & technique. It sure makes good material for the shredder though, or maybe to use to start a fire with when camping.